We’ve been making a pleasant habit of visiting botanical gardens in Hawaii. 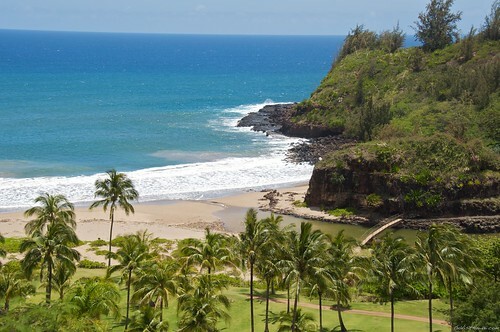 So on our recent visit to Kauai, we planned a visit to Allerton Gardens in the Lawai Valley in Poipu. Allerton Gardens are managed by the National Tropical Botanical Garden. From their website, they describe the heritage of Allerton as “a garden paradise, transformed through time by the hands of a Hawaiian Queen [Queen Emma], by a sugar plantation magnate, and most significantly by an artist and an architect.” Robert Allerton was the artist and his adopted son, John Gregg Allerton, was the architect. Together, their combined talents designed a unique garden concept of outdoor rooms. An example of One of the outdoor rooms designed by the Allertons. Most rooms included a water feature. A guided-tour ($35 per person) leads visitors through garden rooms while explaining the room design, significance to the Allertons, and the types of plants and trees that were chosen. The guided tour includes a 10 to 15-minute tram ride to and from the visitors center to the Lawai Valley and Allerton Garden. The views along the way are truly fantastic and almost worth the visit alone. In addition to the excellent Lawai Valley views and exploring the garden rooms nestled by the peaceful Lawai Stream, we also enjoyed seeing Queen Emma’s colorful wall of bougainvillea planted by Queen Emma herself.. She retreated to Lawai to morn the loss of her husband and her son. Guided-tours (2.5 hours duration) are offered daily at set times. See this link for more information making reservations to tour Allerton Gardens. I might suggest that you take the early tour before the sun warms up the valley too much. Beyond the set tour times, there’s a special sunset tour. It’s a little pricier but it includes pupus (hors d’ouevres) tours of the Allerton’s home. Wear sunscreen, hat, mosquito repellent and comfortable walking shoes. I wore long hiking trousers and I was glad I did as they protected my legs from mosquito bites. We had a little trouble finding the entrance to the National Botanical Garden Southshore Visitors Center. But, if you know this, it will be easy for you – the entrance is directly across from the Spouting Horn parking lot. Don’t miss meandering around the Hawaiian Garden at the Visitor’s Center. It’s free and well worth the visit. It’s open daily from 8:30 a.m. to 5:00 p.m. Which gardens do you recommend on Oahu? Gajen – to be honest, I’ve not visited any of the botanical gardens on Oahu. But, a couple of readers who live on Oahu highly recommend Hoomaluhia Botanical Garden in Kaneohe. Here’s their website: http://www.co.honolulu.hi.us/parks/hbg/hmbg.htm#visitor I’m hoping to visit it myself this coming October.